It seems that one of the greatest challenges that Mormons (members of The Church of Jesus Christ of Latter-day Saints) face today is public opinion surrounding the historical but long-discontinued practice of polygamy. Those who oppose the LDS Church use this topic as often as they can to try and paint the church and its members as anything but good people. The reality is, when there is a genuine interest to understand and learn about the history of polygamy, a better assessment can be made about Mormons and what they believe. The Deseret News has finished up their five part series on the recent Pew Research Center Forum on Religion & Public Life, ‘Mormons in Ameria’ survey results, which were recently released. In this their final article, “Mormons say Polygamy Morally Wrong, Pew Poll Shows,” not only is polygamy addressed, so are some other very sensitive and important topics. If there is one thing that many can agree on it is that Mormons seem to be clean-cut, innocent people with very high moral standards. We saw this most recently on the past season of NBC’s “The Sing Off” when the BYU acapella group Vocal Point displayed their amazing talent for the world to see. During the comments from the judges, there was often reference to “clean-cut”, “pure”, “innocent” and “warming.” So there seems to be one fairly strong opinion about Mormons. However, there are also other opinions that may not cast the LDS faith in the best light. When discussions about polygamy, morality and homosexuality are brought to the forefront, it seems that negativity and misperceptions abound. 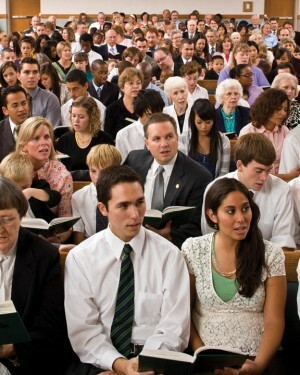 The Desert News article states, “According to the study, members of The Church of Jesus Christ of Latter-day Saints unequivocally reject polygamy — only 2 percent said the practice is morally acceptable — evidence of a yawning gap in what Mormons believe and how they are perceived.” So it is good to see that Mormons today are against this practice, but there is still the issue of having to explain the past and this is where many outside the church get uneasy. There is for some reason a feeling that religions should not change at all, but the scriptures promote change, especially the Holy Bible. It is that change that must happen for people to find happiness in this life. The Deseret News article then breaks down the survey results in three main areas — Morality, Homosexuality and Polygamy. While many know that Mormons focus on the importance of marriage and families, the Deseret News points out that “only 25 percent of Mormons surveyed said divorce is morally wrong.” So while there is great emphasis on eternal marriage, there seems to be a feeling that divorce may be necessary and if so, it is not necessarily a moral issue. Other items the article mentioned were, “54 percent said drinking alcohol was morally wrong, compared with 15 percent of the general public.” I guess this can explain why Brigham Young University ranks at the top of charts when the annual “Most Sober Universities” is presented. The article brings up the thought that it is because of these types of beliefs of not drinking or smoking that cause some of the tension with non-Mormons. There may be a feeling that Mormons feel that those that do those things are bad or evil. There may need to be some work done to help those of the LDS faith to learn how to live their beliefs while also not alienating others for their actions. Here it might be worthwhile to clarify LDS church policy regarding homosexuality. It is that homosexual tendencies are not sinful, but any sexual behavior outside of marriage (defined as the legal union of a man and a woman) is sinful. The LDS Church can never and will never condone homosexual marriage, but promotes all other rights society is able to offer gays. Salt Lake City has the third largest gay population of American mid-sized cities, and was recently named the #1 city for gays in the U.S., largely because of the influence of the LDS Church. Finally, the 900 pound gorilla in the room continues to be in the area surrounding polygamy. It just won’t go away. The article points to something that helps drive the misunderstanding about polygamy and Mormons, “…were it not for the confusion surrounding Mormons and the FLDS Church practice of plural marriage.” It seems that every time there are news worthy items involving the FLDS polygamous religion, the Mormons get put into the same bucket. The truth is that there is no relationship between the FLDS fundamentalist polygamist groups and the LDS Church. Though the FLDS call themselves “Mormons,” they are not members of the Mormon faith. The LDS Church has worked very hard to try and communicate the difference and in large part has done a good job. However, the connection for many is still there. The article states that 86 percent of respondents stated that polygamy is morally wrong. Although a good percentage, it is that other percentage that helps fuel the issue for those that want to keep this argument going. At the end of the day, the LDS Church has done, is doing, and will continue to reach out to those who want to learn more. They are a church that teaches principles that help to create a life full of peace, harmony, health, success and happiness. With all the don’ts that non-LDS people notice about the Mormons, the number of Do’s outweigh them 10 to 1. If we are currently in what has been labeled “The Mormon Moment,” then now is a good time for Mormons to reaffirm what they believe, and for those that have questions, to ask them but be willing to listen. To see the 5-article Deseret News series on the Pew Forum Study, go to Mormons in America. Seth Saunders is currently branch president of the Pembroke Branch (Spanish) and a founding board member of The Pink Shoe Hero Foundation. Seth has been married 15 years to his amazing wife Amber and is the proud father of three wonderful sons.